Round 4 is Out the Door…Only 2 More! 10/8/2013 | Travis the Warrior --- Kickin' Cancer! Travis came home last night and we all slept great in our own beds! With Round 4 out the door and only 2 more, we are now officially 2/3 of the way done with chemo. Yeah! 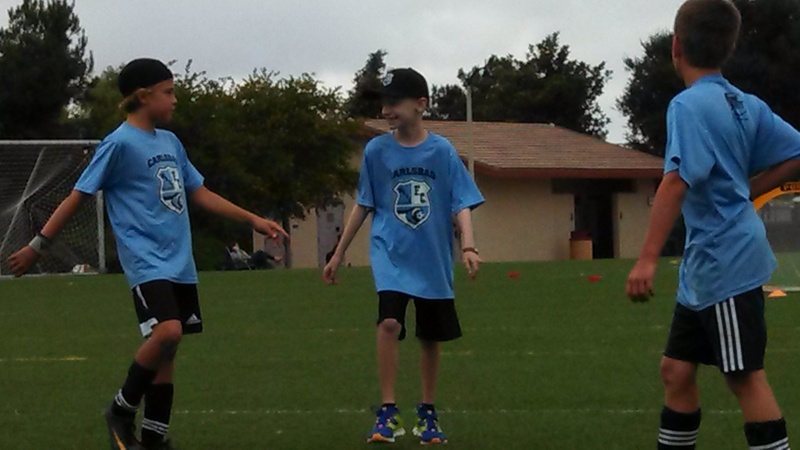 As we mentioned, on Thursday evening, Travis went to soccer practice and stayed the whole time with the team. He just loves being with his friends and wanted to get the most out of it since chemo was starting the next day. 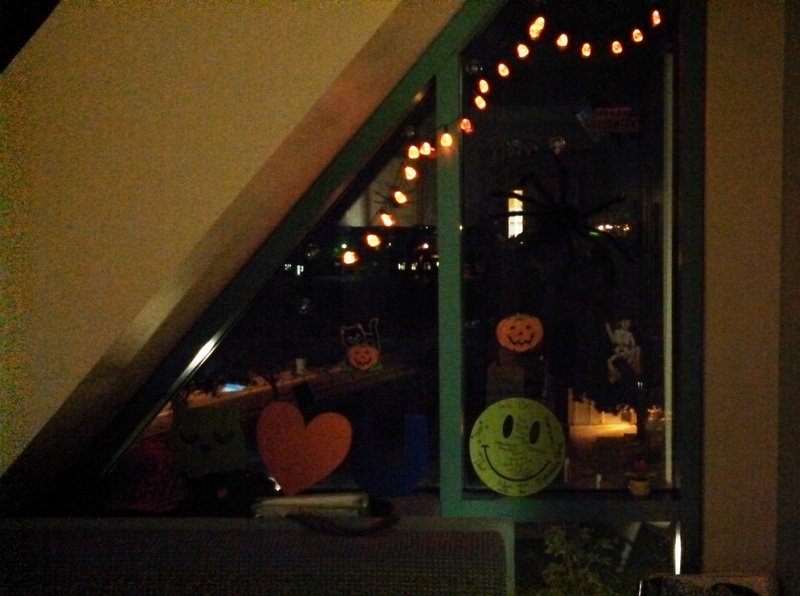 Friday began with our normal check-in and we immediately started decorating our room for Halloween. We know it is a bit early but if Costco can have their Christmas decorations for sale already, what are a few weeks early for Halloween since at least we are in October now, right? We have been battling a little issue with Travis’ port area on the incision where it was installed for a couple of months or so. It kind of looks like a slight infection and they gave us antibiotics for it but all of the cultures keep coming back negative. The vascular surgeon came in on Friday to take a look and made a slight adjustment on how they access his port since that is about an inch below the affected area at the incision. Things seemed to look better when we left so we are keeping our fingers crossed that everything heals up. Travis worked on his school work over the weekend and he is so good about wanting to stay caught up. With a soccer game on Saturday and the Wave Fall Festival on Sunday, it kept us coming and going. But we did manage to squeeze in some Movie and TV time that we normally don’t have time for at home. We were able to watch Iron Man 3 and Epic movies. Then we supplemented with TV by watching some of American Pickers, Pawn Stars and Duck Dynasty. It is always a fun way to pass the time! To tell you the truth, Rounds 3 and 4 have been so different from Rounds 1 and 2. Maybe with the chemo dose reductions combined with the new anti-nausea medicine (palanosatron), Travis has not experienced any nausea or the sick feelings from before. In fact, he was eating something at every meal, getting up out of bed for most of the day, making it outside for a picnic or to get some fresh air and having some visitors stop by. That is totally opposite from Rounds 1 and 2 where it was all we could do just to maintain. We are praying the trend continues into the final stretch. Martine and Olivia stopped by on Sunday and it was nice to have them visit. 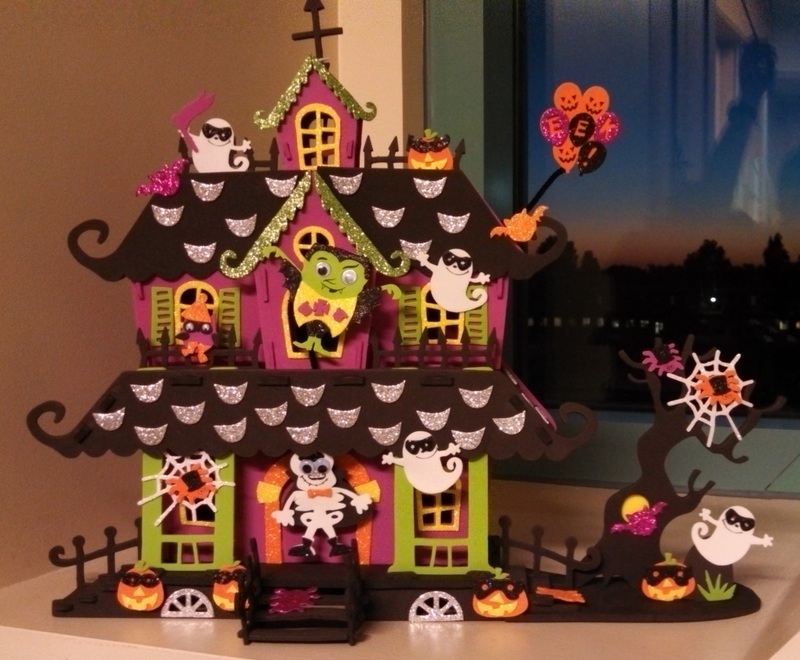 Thank you all so much for the Haunted House craft! 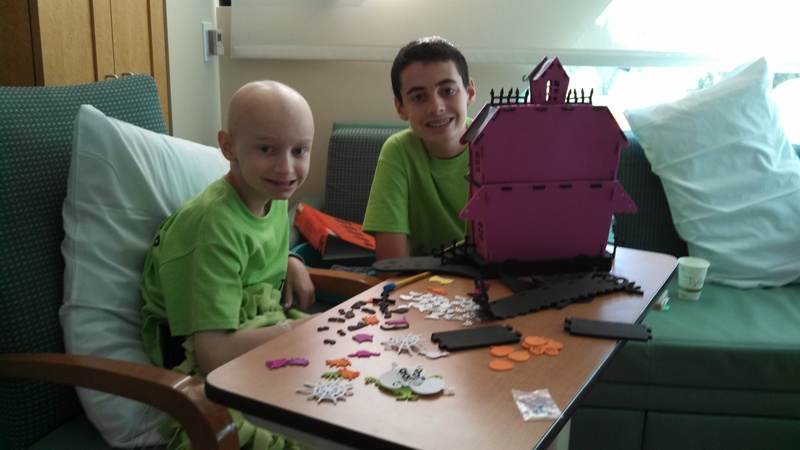 Travis and Tyler had a great time working on the project and all of the doctors and nurses were very impressed with the level of detail, not to mention how it complemented the Halloween decorations in the room. Over the weekend, we met a 7 year old little boy who is battling bone cancer in his leg around the thigh area. He is being cared for by his grandparents who have legal custody and they are like angels who swooped in to take care of him. He was in the hospital for his third round of chemo. He is pretty shy and does not speak much to people he just meets, maybe due to dealing with his situation and losing his hair to chemo. But he would whisper in his grandmother’s ear and we heard later that he told her that he really liked meeting Travis and he had fun when they stopped by to visit. It seems like the boys were really able to relate with their situations. We heard on Monday that since his cancer is inoperable and they can only use chemo and possibly radiation to treat him, one of the treatment options they are considering is to remove his leg. Wow, it is hard to imagine! It really puts things into perspective and makes you grateful for any small victories you have along this hard journey. We will keep him and his family in our prayers and we hope for the best for him! When we arrived home yesterday, we had a great meal delivered by the Garman family which couldn’t have come at a better time. Thanks so much you guys! Sorry you were not able to visit over the weekend but hopefully Reed and Collyn are feeling better soon. Well, as we said, Round 4 is Out the Door…Only 2 More! I love the Haunted House! You sure know how to make the most out of a hospital stay! So happy you are on the down hill side of your treatments. So happy Travis is doing so well. What a high. I’ll pray for the 7 year old boy. Love the haunted house. All of the pictures are great. We are so happy that “Round 4 Is Out The Door” – Woo Hoo! ‘So great seeing you and Tyler the other day! Just think, you’re in the home stretch now… 🙂 We’ll talk soon and plan some fun adventures!